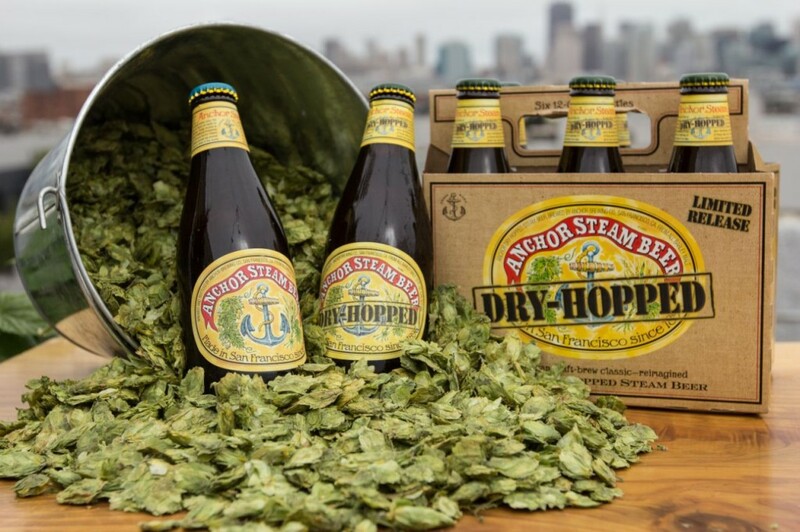 Anchor Steam vs. Anchor Dry-Hopped Steam: What’s the Difference? California Commons are a uniquely American style of beer; created by fermenting lager yeast at warmer ale temperatures. This creates a hybrid between the two beer styles, though lager yeast is always used. 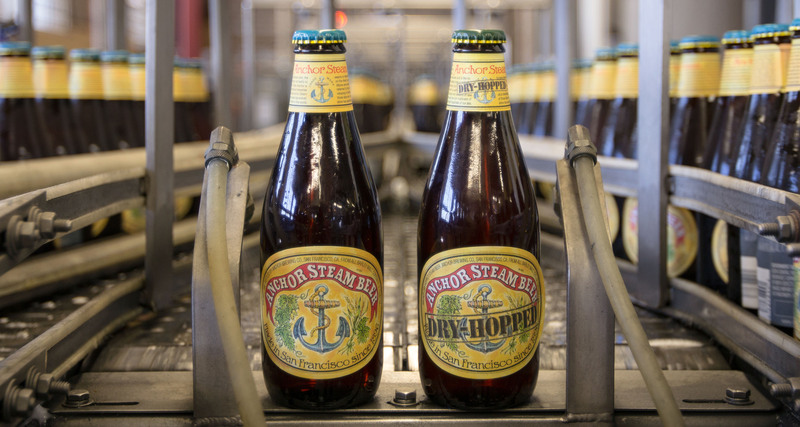 Anchor Steam® Beer is the original California Common made in San Francisco since 1896. To give this classic beer a radically traditional twist, Brewmaster Scott Ungermann created Anchor Dry-Hopped Steam Beer™, available nationwide for a limited time. “What’s the difference between the two?,” you may ask. Well, that’s what we’re here to explain. The chart below gives a nice visual too. To start with, both of these beers have distinct, unique recipes and ingredients. Their mash bills– the blend of malted barley used– both combine 2-row pale malt and caramel malt, but have varying ratios. Anchor Steam requires more caramel malt, contributing to the caramel, biscuity flavor. In contrast, Anchor Dry-Hopped Steam has less caramel malt, creating a more reserved malt flavor and lighter body. Regarding hops, both beers use Northern Brewer hops in the boil during the brewing process. Anchor Steam, being a classic California Common, is not dry-hopped. Anchor Dry-Hopped Steam is dry-hopped (naturally) with Cascade and Experimental No. 484. Both beers use our in-house lager yeast strain and are open fermented at warmer temperatures in traditional California Common fashion. Hops contain compounds that add to the aroma, flavor, and bitterness of the beer. During the brewing process, hops are added at the beginning, middle, and end of the boil. As a result, bitterness and hop aroma is contributed, however some of the fragile hop aromatics are lost. The goal of dry-hopping is to replace and enhance the hop aromatics of the beer. Much like making tea, dry-hopping is a steeping process to infuse the beer with rich fragrance. Depending on the variety, the hops will contribute any number of aromas including pine, citrus, herbal, floral and fruit. “But what about Brotherhood Steam Beer? Isn’t that a California Common too?” Yes, Brotherhood Steam— a collaboration brew created with the Chris Robinson Brotherhood— is a California Common as well. The malt bill creates a lighter body and malt flavor in comparison to both Anchor Steam and Anchor Dry-Hopped Steam. In terms of hops, Brotherhood Steam also uses Northern Brewer in the boil, but is dry-hopped with Citra and Nelson Sauvin. Regarding hop bitterness and aroma, it lies somewhere between Anchor Steam and Anchor Dry-Hopped Steam, boasting earthy, tropical, and citrusy aromas. For more information on where to find Anchor beers near you, use our beer finder. And remember to always #RaiseYourAnchor to the continued evolution of our craft brews.